The outdoor spaces of your home add a lot of openness and freshness to your property. When you get these designed, you choose the plants and trees with care and ensure that you have some lawn space. However, there are some features apart from softscaping that are equally important and become the basis of your garden or yard space. As part of our services, we provide excellent hardscaping solutions like paver driveways, pathways, and patios. Pavers are very strong and are able to weather climatic changes very well. They are individual units and, unlike poured concrete, they do not naturally crack over time. This makes them perfect for patio spaces and high traffic areas on your property such as driveways and pathways. Pavers can be made of concrete, brick or natural stone and all these materials are suited for outdoor use. For instance, if you have a patio with any stone features, you can choose to get natural stone paving as it will complement the look of the space. Brick pavers have a very classic appeal and they look great in almost any landscape because their rustic appearance blends in well with other landscape features too. Everyone likes to have a landscape that’s unique and appealing, and when you opt for pavers, you get the flexibility to create the kind of look you want on your property. These are available in a variety of designs, colors, and textures. You can even opt to get interlocking pavers. For a non-slip surface, choose textured pavers. This is a very vital factor as current day homeowners are very busy and like to have installations and features that are low maintenance on their property. All it takes to keep your pavers looking like new is an occasional pressure-washing. 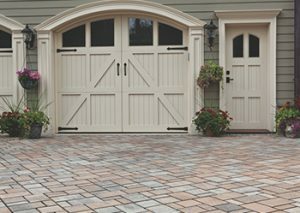 You also have the option to get paver sealing done once every two years; this helps protect the surface from dust, dirt, grime, and stains. Not all paving is inexpensive and ones made of natural stone tend to be priced higher than the concrete and brick ones. However, since they are all strong and long-lasting, they provide value for the money. Ivy Studio are the landscape design experts that provide comprehensive landscaping solutions to the greater Boston and Massachusetts Bay area. Get started on your landscape design project today to discuss having patio pavers or driveway pavers installed, or take a look at the other landscape design services we offer.